Gmail uses many different algorithms to determine inbox placement as well as delivery of your messages. Those algorithms use countless points of reference such as engagement, complaints, bad addresses for a combination of sending subdomain and top domain, bounce domain and DKIM, IP address, body content, branding, source coding, etc. Therefore when you have an issue, troubleshooting can be overwhelming. Below are the top 15 best practices you should follow in order to avoid issues to begin with when sending to Gmail. Opt-in. Gmail strongly suggests double opt-in or confirmed opt-in when possible. However, single opt-in is a must. It is important that each subscriber opt-in to the exact message stream they are receiving. It is not enough that they opt-in for your type of message. For example: Katie opts-in to receive messages sent by JobSiteA. This does NOT mean that JobSiteB can start sending Katie messages simply because it is the same subject matter or even owned by the same parent company of JobSiteA. Katie has to explicitly opt-in to JobSiteB’s messages. Engagement. The most important thing to remember is to send messages to subscribers who are engaged with your brand. They are opening, reading, clicking and interacting with your brand. Interacting may mean purchasing or even getting involved with the discussion depending on your business model. Develop a list hygiene process to remove non engaged subscribers from your active sending list on a regular basis. Overall list hygiene. Do not continue to send to email addresses that no longer exist or hard bounce (SparkPost suppresses hard bounces). Do not continue to send to subscribers who have not opened or clicked in a reasonable time. This length of time really depends on your business model. 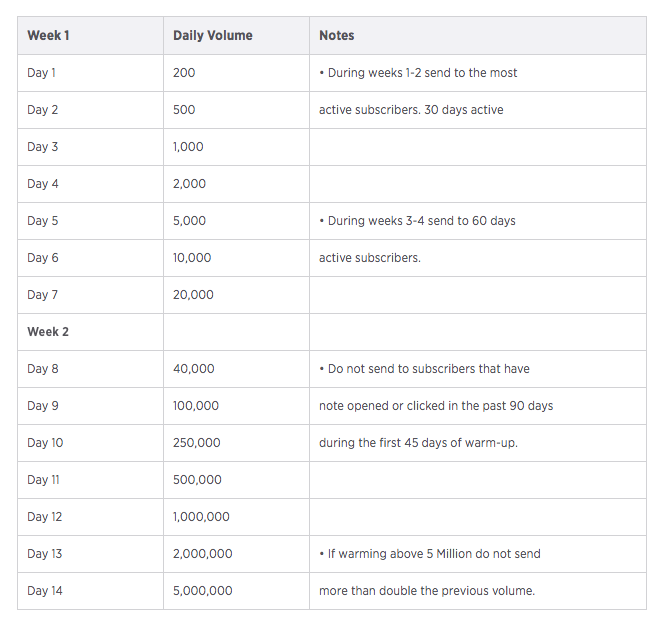 A good rule of thumb is that actively engaged subscribers will open and/or click on your daily messages at least once in a 30 day time frame and at least once on your weekly messages within 90 days. Any subscriber that has not opened or clicked on your messages in the past 12 months should be permanently removed from your list as they run the risk of becoming a spam trap. Monitor blacklistings. Gmail does use 3rd party blacklists (which ones are unknown) to determine inbox placement. Avoid URL shorteners. Gmail will block most of them if used in bulk mailings, especially bit.ly. Use the unsubscribe header. Make it easy for subscribers to unsubscribe from your message! Spam complaints are not shared back to you through feedback loops like other ISPs. Therefore it is crucial that your subscribers unsubscribe rather than reporting as spam. SparkPost deploys the list-unsubscribe header and suppresses unsubscribes. Avoid affiliate marketing. Gmail states you should avoid affiliate marketing as a tactic. It is also against SparkPost policy to send affiliate marketing through our system. Authenticate. Authenticate with both SPF and DKIM. Subdomains. Use different subdomains that define your different email streams. (Example: newsletter.example.com; deals.example.com; confirmation.example.com) Be consistent. Don’t add too many as you want to be able to develop a reputation for each subdomain. However, remember that the top level domain reputation is also important. Engagement. The key is to send to the most active first then add in the lesser engaged as the volume builds over time. Due to the introduction of folders, subscriber traffic can now be delivered to additional locations and not solely the inbox or spam folder. It is not like the scary wasteland of lost messages called the SPAM folder. If you have an interesting subject line and a brand that your subscribers want to engage with, the promotions tab will still get you opens and clicks. Per-user filtering. Remember that just because some subscriber messages may be in the promotions tab does not mean that all subscriber messages are in the promotions tab. Filtering is done on the individual subscriber level not bulk sender level. HTML to Text Balance. Keep the balance of HTML to text similar. Encourage Interaction. Subscriber awareness is important. Train your subscribers to expect the message and move the message into the Primary tab. The messages should start going to the Primary tab after a few moves. Don’t send a promotion. When the above fails and you need a message to get into the inbox design your message to NOT look like a promotion. Personalize your messages. Include the reader’s first name in your message to Gmail subscribers. Lose the images. Gmail sees images as a sign of a promotion or spam message. You will increase your readership by not having pictures. Letter format. Design the Gmail template to look more personal and natural like an email. No obvious calls-to-action. The best way to keep from looking like a promotion is to have no more than 1 link and no upsells or RSS Feeds. Keep it short and simple like talking to a friend. Appreciate the promotions tab. When it comes down to it, if a subscriber wants your message in the primary tab they can move it there and will receive it there after a few moves. However, Gmail’s tabs are not new and subscribers know how they work and often go to that tab for promotions they are interested in. The promotions tab can actually work in your favor. For example, if a subscriber is very involved in social media and receives a large volume of social media notifications, marketing messages can get lost in the inbox and separating them out to the social tab can actually be a plus, which leaves your message to be seen at the top of the promotions tab easily found by your engaged subscriber. Just remember that if you send your subscribers what they want and leave them wanting more they will go to that promotions tab to see what you have to say! Spam Traps Part 1 - What Are They? What are spam traps and why should care about them? In this part 1 of 3 part blog series we'll answer those questions and how it can impact your email program and how you can avoid sending to them. Email deliverability doesn’t have to be a mystery. Get our easy, step-by-step guide on deliverability for beginners and be on your way to sending success.